UPDATE: the webshop is open and Frogs is available to buy!! Thomas Ilg, of Laserball and Anarcho Ride fame, has released an early beta of his next project: Frogs. 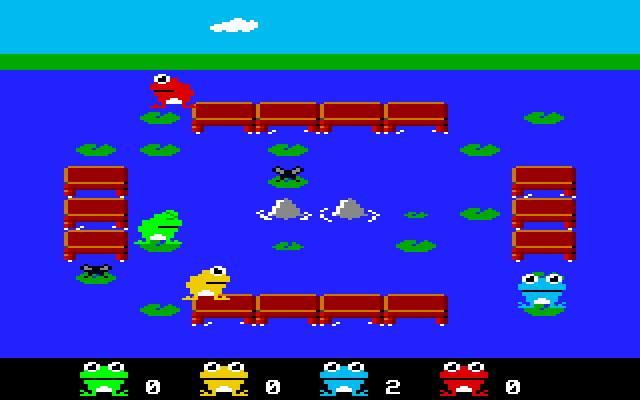 This is an Atari STe conversion of the C64 original and features more of the same zany gameplay with up to four little froggies frantically hopping around ponds munching defenceless bugs. 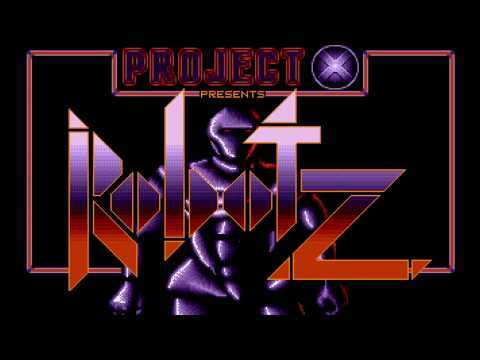 Older ST's are compatible to a degree but it's best on the Atari STe computer thanks to the Blitter graphics and DMA sound effects (chip music isn't yet complete). Each pond has various rocks and temporary lilypads which stay on the water's surface for only a short time. Hop around the screen looking for bugs and then press fire to stick out your tongue and feed your belly. Be quick and beat the other players but watch out because their AI is absolutely superb - it's great fun watching them brawl amongst themselves!! Oh, tongues have more than one use but don't let yourself be pushed around too much!! 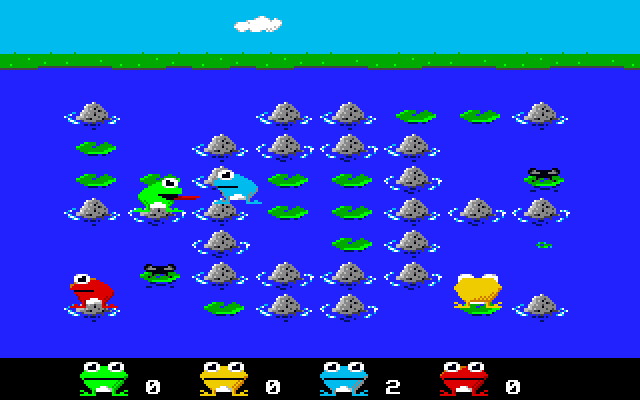 Numerous ponds are available with three different gameplay modes and support for 2-4 players. Controls are rather unique using the keyboard, joystick, Jagpad or ST4PLAYER via the parallel port. Players can either be human or computer-controlled and there's even the option for a Midi link-up. Tell me you're not impressed!! There are many ponds with which to feed and (in the third pic) you can even use C64 graphics.